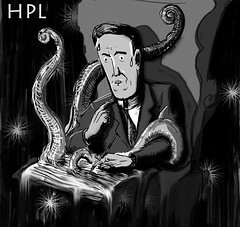 Howard Phillips Lovecraft died in 1937 at the age of 46, survived neither by wife (his marriage to Sophia Greene had fallen apart years beforehand, although they never officially divorced), nor children (they never pursued parenthood), nor fortune (Lovecraft died in poverty). But he did leave behind scores of short stories, baroquely styled, bleak in tone and largely focusing on transcendently horrible otherworldly forces. His relatively small oeuvre has had an oversized impact on culture at large, with genre greats such as Neil Gaiman, H.R. Geiger, Joyce Carol Oates, Guillermo Del Toro and Stephen King all claiming him as an influence. Yet I know very little about him. Don't get me wrong, I'm not completely ignorant. I've brushed up a bit on old H.P. 's past, as evidenced in the above paragraph. I've read some delightful pastiches, like Sarah Monette and Elizabeth Bear's "Mongoose" and Samantha Henderson's "Maybe the Stars." I've even picked up a few of Lovecraft's original tales, most notably "The Call of Cthulhu." Yet I can't claim any sort of comprehensive knowledge about the author or his work. Well, I want to change that. In 2012, I'm going to give myself an eldritch education. Here's how it will work: Over the next twelve months, I plan to read each and every piece of fiction that Lovecraft himself wrote. Note that this excludes several stories in which uncredited collaborators had a hand. To guide me, I've chosen the S.T. Joshi-edited anthologies The Call of Cthulhu and Other Weird Stories, The Thing on the Doorstep and Other Weird Stories and The Dreams in the Witch House and Other Weird Stories. Every two weeks, I'll post my reviews of recently read tales, providing a plot synopsis, a sample of Lovecraft's inimitable prose, and my oh-so-humble opinion about each story's scariness (ranked on a scale of 1 to 5 sanity-shredding shoggoths, which the talented Ollwen Jones has winningly illustrated). All right, then. Let's see it. I hope it's a good year for you. It will be an interesting one, that's for sure!